Give her your heart on that special day. These diamond Claddagh rings are part of our Claddagh Engagement Ring Collection. Experience the ultimate type of luxury with a Diamond Claddagh ring. The Claddagh ring is a symbol of love, loyalty and friendship. When you give someone a Claddagh ring, you are giving them your heart and crowning that love with your loyalty. The famous Claddagh ring has become so popular that it is now combined into many pieces of Irish jewellery, however, wedding bands and engagement rings have become prominent on the wedding scene in recent years. The Diamond Claddagh Ring collection features fabulous Claddagh Diamond set rings, Emerald set rings, Ruby set rings and Sapphire set rings, Claddagh Wedding Sets and Two Part Diamond Crowned Rings. Each ring is individually made and has been inspired by famous locations in Ireland. The Ashford Claddagh collection, the Cashel collection, the Kinvara collection and our Kylemore collection, will leave you spoilt for choice. The unique design in each collection showcases the Claddagh symbol. If that wasn't enough we have Claddagh Wedding Sets which are expertly crafted in-house. These rings are beyond beautiful, they are stunning in every way. The rings are available in white gold, yellow gold and platinum. They are made with the finest 14kt and 18kt gold. Even though many of the items in this collection are bought as engagement rings, many people buy Diamond Claddagh Bands as gifts for their partners. 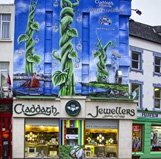 Claddagh Jewellers are renowned for making the Authentic Claddagh ring ™ . Our Claddagh rings are sought after from people all over the world and we continue to grow every year. Check out our exclusive collection of Claddagh engagement rings today. Please do not hesitate to contact us if you have a specific style in mind. We are happy to help.